The flexibility and performance of professional quality UHF wireless specifically designed for houses of worship, trade shows, schools, businesses and club installations at a moderate price. UC systems can be configured with handheld, lavalier, headset and instrument cable options. Each UC system features more than 100 fully selectable frequencies and the ability to operate up to 16 systems simultaneously. When using the UC 1 bodypack transmitter, you can use almost any microphone, and the pre-configured systems come with microphones such as the UC 2 handheld series or the WL series lavalier microphones. 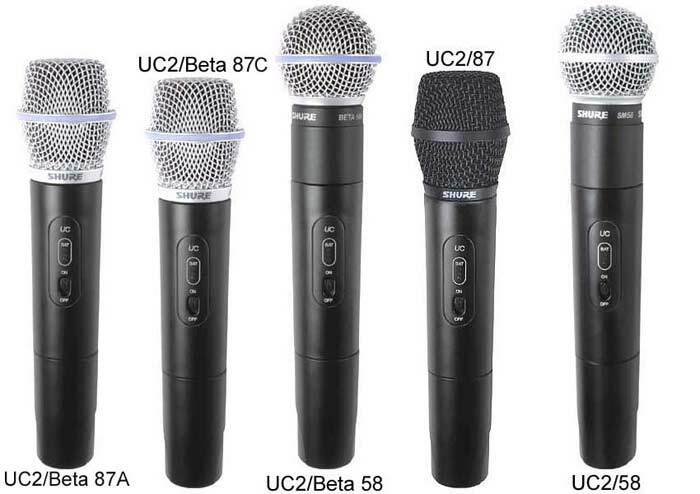 The UC 2 handheld transmitter comes with a choice of 5 microphone heads that can be screwed onto it (SM58, SM86, Beta58, Beta87a or Beta87c). The following table shows all the Shure UC series wireless systems. The lefthand column is the model number, and these numbers show what components are included in each system. UC24/58 - This model uses the UC2 transmitter, UC4 receiver and the SM58 microphone head. 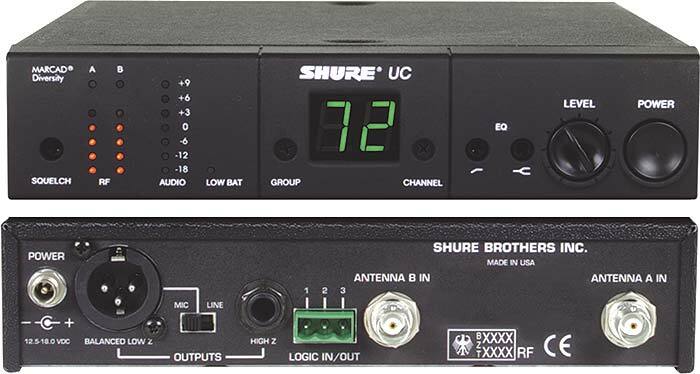 UC14/93 - Includes the UC1 transmitter, UC4 receiver and WL93 lavalier microphone. UC124/85/SM58 - Combo system with UC1 and UC2 transmitters, the UC4 receiver, WL185 lavalier microphone and SM58 microphone head. UC2 transmitter with SM58 microphone head, UC4 receiver. UC2 transmitter with SM87 microphone head, UC4 receiver. UC2 transmitter with Beta58 microphone head, UC4 receiver. UC2 transmitter with Beta87a microphone head, UC4 receiver. UC2 transmitter with Beta87c microphone head, UC4 receiver. UC 1 transmitter, UC4 receiver, WH20 microphone. UC 1 transmitter, UC4 receiver, WH30 microphone. UC1 transmitter, UC4 receiver, WL50 microphone. UC1 transmitter, UC4 receiver, WL51 microphone. UC1 transmitter, UC4 receiver, WL183 microphone. UC1 transmitter, UC4 receiver, WL184 microphone. UC1 transmitter,UC4 receiver, WL185 microphone. UC1 transmitter, UC4 receiver, WL93 microphone. UC1 & UC2 transmitters, UC4 receiver, WL185 & SM58 mics. UC1 & UC2 transmitters, UC4 receiver, WL185 & SM87 mics. UC1 & UC2 transmitters, UC4 receiver, WL185 & Beta58 mics. UC1 & UC2 transmitters, UC4 receiver, WL185 & Beta87a mics. UC1 & UC2 transmitters, UC4 receiver, WL185 & Beta87c mics. UC1 transmitter,UC4 receiver, WA302 cable. UC1 transmitter, UC4 receiver, WB98h microphone.